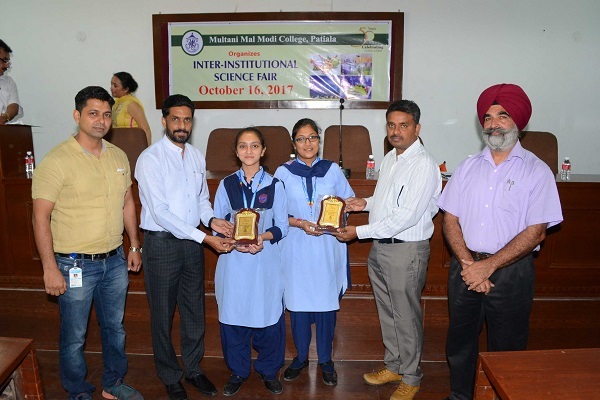 Inter Institutional Science Fair was held at Multani Mal Modi College on the eve of Modi Jayanti on 16th October, 2017. 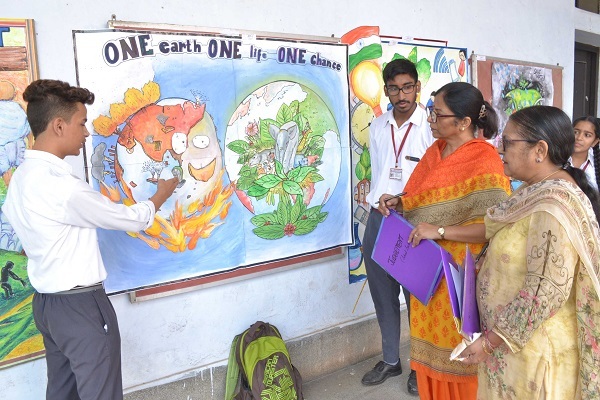 A competition was held for Static Models, Working Models and Poster Presentation on the theme ‘Science for Mankind’. Around 260 students from 12 schools and 8 colleges participated in the Science fair. 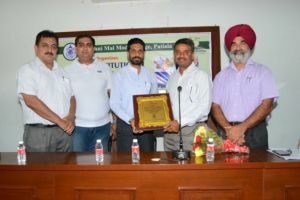 The valedictory session of the Science Fair was presided over by Chief Guest Dr. M. S. Reddy, Dean Research, Thapar University, Patiala. Dr. Khushvinder Kumar, Principal welcomed the Chief Guest, Judges, teachers and participants of various competing institutes and said that such exhibitions and fairs are imperative to promote critical thinking regarding global issues and encourage the students to use design and creativity to showcase their scientific and technological skills. Dr. Reddy appreciated the organizers and the participants for this endeavor. He further said that such events foster scientific temper among the students. Dr. Ashwani Sharma, Coordinator, introduced the theme of the fair. Poster Presentation – Jahnvi and Nitika of Saint Peter’s Academy, Patiala and Navdeep and Kanchan of Career Academy School, Patiala got 1st position, Kuljeet and Sameeksha of Bhupindra International Public School, Patiala and Seerat and Nimrat of Budha Dal Public School, Patiala bagged 2nd position and Sonia Seikh of Pioneer Public School, Patiala and Gurpreet and Narinder of Guru Nanak Foundation School, Patiala got 3rd position and Gracy and Dharampreet of Kaintal School, Patiala got consolation prize. Static Model Category – Nishita, Aishwarya and Siya of Our Lady Fatima Convent School, Patiala bagged 1st position, Guruyansh and Vedant of Budha Dal Public School, Patiala got 2nd position and Bhavanpreet Kaur and Jobanjot Kaur of Career Academy School, Patiala got 3rd position, Kulraj Singh, Gurpreet Singh and Varshpreet Singh got consolation prize in this category. Working Model Category – Mehakdeep Singh, Sumeet Singh, Sehajpal Singh of Guru Nanak Foundation School, Patiala bagged 1st position, Gautam and Akshay of Career Academy School, Patiala got 2nd position and Abhinav and Abhishek of Saint Peter’s Academy, Patiala and Aditya and Shree Ram got 3rd position, Aditya of British Co-Ed School, Patiala got consolation prize. Poster Presentation – Pahul P. K. Sandhu and Arshpreet Kaur of M M Modi College, Patiala bagged 1st position, Ravish Mittal and Sonia Rani of Khalsa College, Patiala got 2nd position and Simarjeet Kaur and Navneet Kaur of State College of Education, Patiala got 3rd position, while Vaishali and Tejinder Singh of Asian Education Institute got consolation prize. Static Model Category – Pardeep Kumar, Jaskaran Singh, Gurneet Singh of Govt. 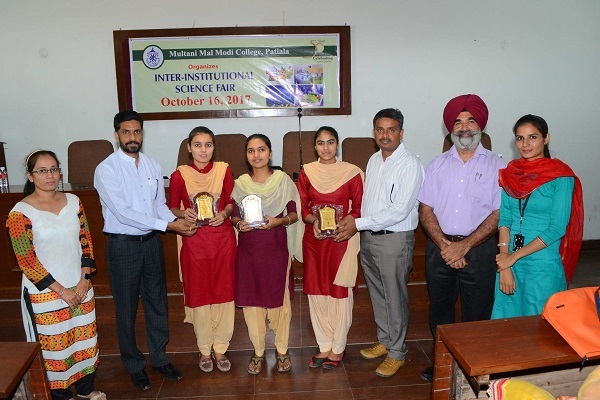 Mohindra College, Patiala got 1st position, Himanpreet, Mandeep Kaur and Ramanpreet Kaur of Tara Vivek College, Gajan Majra, Malerkotla bagged 2nd position and Babanpreet Kaur of State College of Education, Patiala got 3rd position, Shammi and Manpreet Kaur of Tara Vivek College, Gajan Majra, Malerkotla got consolation prize. Working Model Category – Upninder Kaur and Baltaj Singh of Khalsa College, Patiala got 1st position, Manthan and Karan Sukhwal of M M Modi College, Patiala got 2nd position and Kuldeep Kumar, Parveen Kumar, Gurmukh Singh of M M Modi College, Patiala got 3rd position, Damanpreet Kaur, Romaldeep Kaur and Khushdeep Kaur of Govt. Mohindra College, Patiala got consolation prize. Mementoes were presented to the chief guests and judges. Vice Principal Prof. Nirmal Singh presented the vote of thanks. Dr. Ashwani Kumar, Co-ordinator of the Science Fair conducted the stage.